The use of marijuana to enhance creativity has been widely known for millennia. There are countless examples of artists, musicians, and great thinkers who have all used marijuana to enhance their creative pursuits. But what is it about cannabis that makes it something that artists gravitate towards? To look at why so many have used the benefits of marijuana we have to look at how artists look at the world and their work. Another benefit of using marijuana in conjunction with creative pursuits lies in its ability to relax the user and feel confident and “think less” about the task at hand. You know who the greatest adversary of an artist is? It’s themselves! You’ve probably heard the saying that “you are your own worst critic” but in this case it couldn’t be any closer to the truth. Artists talk about an “inner voice” which often pipes up and tries to squelch creativity. Generally the creative impulses come from an ability of an artist to connect the dots between two disparate things as we stated previously. Smoking can aid some in squelching that inner voice and just letting it flow. Which is one reason why it’s used both by guitarists ( many of whom are looking for the best strain to use while playing ) as well as Emcees. Marijuana use was also synonymous with the rise of Jazz music, and jazz legend Louis Armstrong was both busted for smoking weed outside of the Cotton Club, but he also wrote a song about it called “Muggles” ( a slang term for marijuana at the time). Of course with the rise of Jazz, and the intermingling of races, came marijuana prohibition, and this isn’t by accident. But marijuana use is not only limited to musicians, and writers. Painters have also acclaimed its ability to open them up and show them unforeseen opportunities. 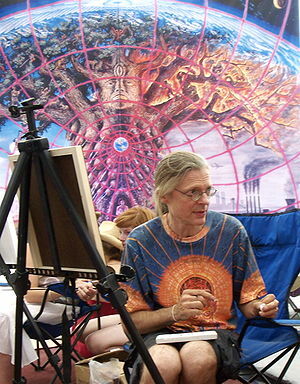 Alex Grey is an outspoken advocate for the idea that “cosmic creativity” can actually evolve more than just our art, but all of consciousness itself. It’s a startling and bold declaration to make, but Grey puts forth a convincing argument as to how artists have used subtances throughout the centuries and how their experimentation and creations have had a beneficial effect for all of mankind. With all that being said, the most important thing to remember is that all of these artists featured here did something which was a lot more important than just smoking weed. And that’s that they practiced a hell of a lot. An inexperienced guitar player won’t become magically good after a few puffs, familiarity with one’s choice of media/instrument is paramount and cannabis can just be seen as something which can be an aid, but not a replacement for hard work. There’s nothing worse than listening to someone completely stoned who thinks they actually sound good! What does Freedom of Religion Mean?